Sawdust on the floor, 30 kinds of beer on draft, and your favorite band ... if that sounds like your kind of New Year's Eve, you should have been with me at The Daily Pint in Santa Monica on the last night of 2006. Minibar is a local treasure (they emigrated here from London years ago), but if there was any justice, they would be a worldwide sensation. From 10 pm until midnight they played all the fan favorites from their three excellent CDs, and then from midnight until two they entertained us with their vast repertoire of covers including The Smiths, Springsteen, Van Morrison, and plenty of Beatles. Vocalist/guitarist Simon Petty is a songwriter that rates up there with all of the above, by the way. Combined with the ultra-talented Tim Walker on lead guitar, masterful Sid Jordan on the bass and incomparable Malcolm Cross on the drums, it was a New Year's recipe I plan to repeat next year. 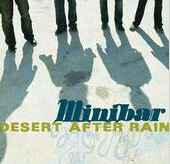 Here's a New Year's Resolution for you: listen and buy their latest, "Desert After Rain", at their site www.minibarfans.com. And listen for their new song "Can I Call You A Cab" in the Jan 11th episode of Men In Trees! Coincidence? I think not.